Hi there! It’s been windy, dark and gloomy all day here in Dubai today. The weather intends to spend a day in the kitchen and bake something warm, aromatic and tasty. And I found a deliciously satisfying dish to cheer this day up! 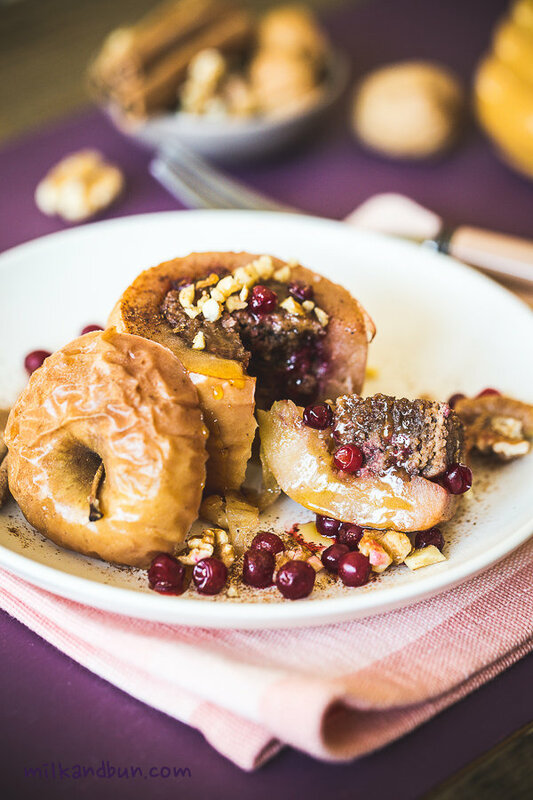 Sweet-smelling baked apples with super tasty filling: walnuts and cowberries! Sounds fantastic, doesn’t it? 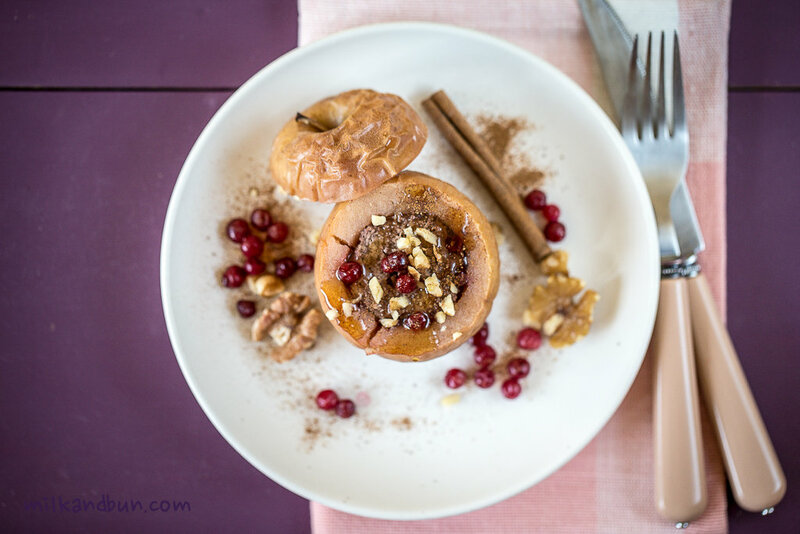 The cozy smell of cinnamon and brown sugar was filling my kitchen while apples were baked.. It’s so easy to turn regular apples into a fabulous warm dessert! Enjoy! Cowberry (also known as lingonberry) is a very tasty, slightly bitter and sour berry; it contains lots of vitamin C, A and B. It’s a popular type of berry in my home-country (Russia), and as far as I know in Sweden and Norway. Their taste remind small sour cranberries, so you can easily substitute it with cranberries (fresh or frozen). *You can add more sugar to suit your taste. **I dry-roast walnuts, then chop it or pulse in a food processor. Cut the lid from apples, carefully cut out the core and make a hole in each apple leaving the bottom. In a bowl, stir sugar and cinnamon with butter. Mix in the egg. Fold in chopped walnuts and berries. Put apples in baking dish/tray and stuff each apple with filling mixture. Cover with apple lids. Pour some warm water into the bottom of the baking dish (1 cm). Loosely cover with foil. Bake in preheated 200C oven for 30 minutes. Uncover and bake for 10-15 minutes more, or until apples are tender but not mushy. Carefully transfer to a serving plate, sprinkle with cinnamon, drizzle with honey and garnish with some walnuts and cowberries, if desired. Dec7December 7, 2015 • By milkandbun • This entry was posted in Baking, Desserts, Festive Cooking, Healthy choice, Russian cuisine and tagged apple dessert, autumn recipe, baked apples, baking, cooking, delicious, dessert, festive cooking, food, food photography, food styling, healthy, healthy cooking, healthy dessert, holidays, lingonberry dessert, low-calorie dessert, photo, photography, sweet, walnuts, winter. Bookmark the permalink. How beautiful and so flavorful. A perfect seasonal dessert! Agree with every word! 🙂 Thanks a lot for your lovely comment, Amanda! Last time I made something like this, my apples turned into an almost apple sauce, I guess I overcooked by a landslide. I am so impressed by how pretty these look and how they are still standing like apples! So pretty, and must be so delicious! Hahahaha Once I baked apples about an hour and they were not even soft, can you imagine! 😀 I guess, it depends on the type of apple. And yes- they are very delicious indeed! Beautiful and healthy dessert, important to have some of those this time of the year! And they are, Daniela! 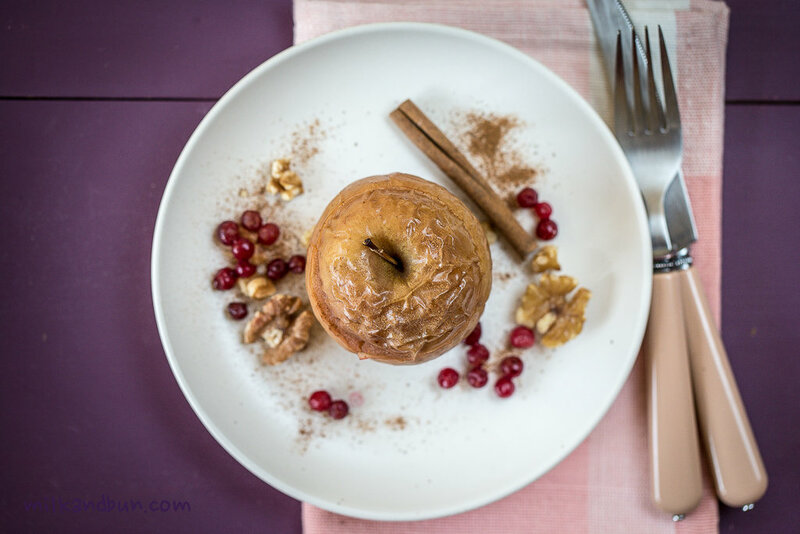 if you haven’t cooked baked apples yet, you have to make it 😀 So delish! This is such a cute idea, and a great alternative to all the rich cakes and pies for a dessert! Thanks so much! You can make it even easier- cut an apple into halves and fill with some nuts, sugar and berries, and then bake! I love baked apples and yours look delicious. I might try them with cranberries since we don’t have lingonberries. You can omit berries or use dried, will be also nice! 🙂 Thanks for stopping by and reading! What a beautiful dessert! I’ve never had cowberries before. I’ll have to look for them! Cowberry taste pretty similar to cranberry (but I mean little and juicy ones), may be a little bit bitter only. 🙂 Good luck and Happy Holidays!